This is part 5 of the Information Technology Transformation series, creating the “Five Year Strategy”. This involves creating the “Tracks” of the “Strategy” and defining the “Projects” that make up each “Track”. Once the “Strategy” is finalised (with priority, timeline and budget), it needs to be approved by Senior Management and then planning and implementation can begin. The 5 Year Strategy defines what needs to happen to get from the Baseline to the Target Architecture. You have your “Baseline” of where you currently are and you have defined the “Target Architecture” of where you want to be. 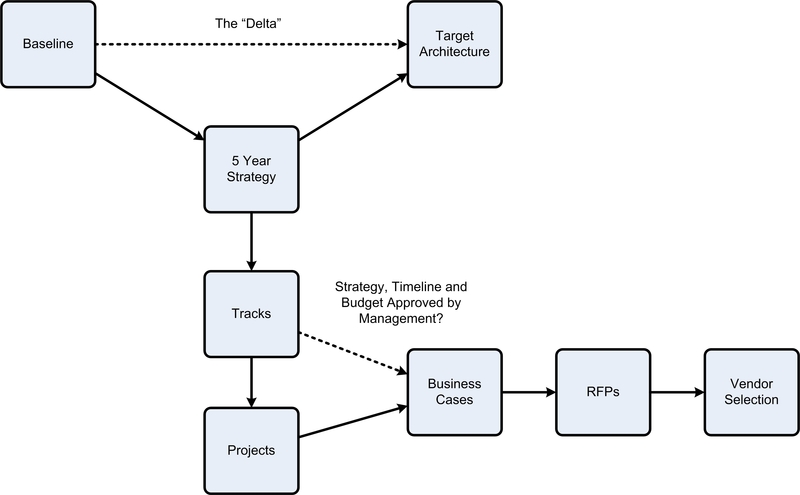 Your 5 Year Strategy is the “Delta”, the difference, documenting the changes you need to make to transform your organisation from a People, Process and Technology perspective. The owners of each area need to define the major “Tracks” with the individual “Projects” required to make that “Track” a reality. Because it is a 5 year strategy, each “Track” needs a “Priority” that will indicate when it needs to be implemented during the 5 year period. Each “Project” also has an estimated “Duration” and “Cost” that needs to be defined. Your job as “Chief Architect” is to ensure that each “Project” and “Track” actually aligns with the Target Architecture and is achievable within the estimated time frame and budget. Your priority projects should target “low hanging fruit”, provide “quick wins” and relieve critical “pain points”. Your first year of success will build confidence and support within the entire organisation. The “Target Architecture” is a logical design, it defines the functional blocks and how they integrate. During the execution of each “Track”, technology selection will be included. It is also very important to consider current projects (in progress and planned), if they do not match the strategy, then they must be modified to match the Target Architecture or be terminated. Here is an example of a 5 Year Strategy. Slide 1 – Current issues that the Business is reporting. Slide 2 – List the Business requirements that drive your strategy. Slide 3 – How the 5 year strategy is going to fix these issues – provide a high level summary of the tracks and how it maps to the Target Architecture. Slide 4 – Summarise the the business benefits (talk about Time To Implement / CAPEX / OPEX / ROI / Operational Savings / Faster Time to Market / Increased SLAs). This step is critical to your success, without management support, you will be going nowhere. Make sure you pressure test your presentation and delivery with your CIO before moving up the chain of command. Ensure you have actual business figures from Finance and Procurement to justify your budget. Remember, this is not a technical discussion, but a business engagement. If you have 5 “Tracks” with 4 “Projects” each, then you will have to follow this process 20 times over 5 years, so it is very important to be organised and on-schedule. Full CIO, COO and CEO support of the Approved Strategy. Approved Enterprise Architecture – make sure you know where you want to go. Approved Budget – No money, no projects. Technical Champions – The “A-Team” become the agents of change. Training Program for current Staff – if people do not have the skills for the new technologies your are implementing, then they will not accept hand-over upon project/track completion. Recruit new Staff with required skills – recruit local resources with the skills you need to complement your existing staff. Use Professional Services & Resident Engineers – very important to use PS/RE services as “training wheels” for hand-over to Operations . Expert Design services – do not spend money on bad design, insist on the best designers/architects in your region. Phased Approach to Transformation – use logical milestones and realistic timelines to execute your strategy. The Strategy needs to be updated yearly, otherwise it will become outdated and lose value. This is true for all documents in the Baseline, Target Architecture and 5 Year Strategy.